The artist's family from whom acquired by the present owner, circa 1993. J. Lewison, exhibition catalogue, Ben Nicholson: the years of experiment 1919-1939, Cambridge, Kettle's Yard, 1983, pp. 11, 52, no. 1, illustrated. N. Lynton, Ben Nicholson, London, 1993, p. 15. J. Lewison, exhibition catalogue, Ben Nicholson, London, Tate Gallery, 1994, p. 14. London, Grosvenor Gallery, 25th International Society Exhibition, May 1919, no. 59. Cambridge, Kettle's Yard, Ben Nicholson: the years of experiment 1919-1939, July - August 1983, no. 1: this exhibition travelled to Bradford, Cartwright Hall, September - October 1983; Canterbury, Royal Museum, October - November 1983; Plymouth, City Museum and Art Gallery, December 1983 - January 1984. The Red Necklace, painted in 1916-19, is one of Ben Nicholson's earliest known works. It is a rare example of his paintings, emerging from a period during which the young artist was developing his own artistic style. As a young man, Ben Nicholson did not intend to become an artist. His parents, Sir William Nicholson and Mabel Pryde, were both artists and he hesitantly attended the Slade School in London in 1910, studying under Professor Henry Tonks. He stayed there for only one year, leaving to travel around Europe between 1911-18 where he studied foreign languages. Due to his asthma, he also travelled to California, and it is possible that The Red Necklace was painted there. 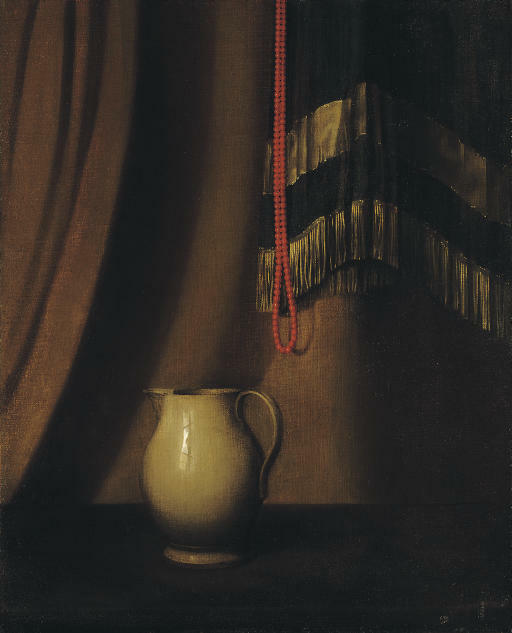 Norbert Lynton discusses The Red Necklace, 'It shows a plain jug on a table in front of a curtain and, hanging just in front of that, a fringed shawl and a long necklace, all done in a smooth manner that explains Ben Nicholson's later reference to some of his early paintings as "slick and Vermeer"' (loc. cit.). Striped Jug, 1914 (Leeds University Art Collection) (fig. 1), is a similar example of his work in which the still-life also features a jug and fringed shawl, painted in a 'slick and Vermeer' manner. Ben Nicholson's paintings from this period are clearly affected by his father's work. In The Times newspaper on 28 April 1963, he states this himself, 'But of course I owe a lot to my father - especially to his poetic idea and his still-life theme. That didn't come from Cubism, as some people think, but from my father - not only from what he did as a painter but from the very beautiful striped and spotted jugs and mugs and goblets, and octaganol and hexagonal glass objects which he collected. Having those things throughout the house was an unforgettable early experience for me' (cited N. Lynton, op. cit., p. 12). A painting by William Nicholson of 1916 called The Silver Casket (private collection) features a red beaded necklace in the lower right corner of the composition, and it is likely that this necklace is the same one that hangs down into the composition of the present lot. Although in The Red Necklace the similarities with his father's work are clear, the work also suggests a departure from the pure influence of William's formal still-lifes. The objects within the painting still indicate this influence, but Ben's arrangement of them shows a different approach. 'The placing of the jug slightly off-centre and the application of white pigment to denote reflected light are similar to William Nicholson's techniques. The dangling red necklace, however, is an informal and original touch which breaks up the contrived nature of the composition' (J. Lewison, 1983, loc. cit. ).